The Minute Paper, One Sentence Summary, What's the Principle, and the Muddiest Point are popular assessment techniques that provide instructors effective feedback on what students have learned during their class. Students typically complete these assessments at the end of class. The Muddiest Point originated in 1989 from Harvard Professor of Statistics Professor Frederick Mosteller’s who asked his students to summarize key points and what more they wanted to know. One of his students perceptively pointed out that there really wasn’t any feedback because students essentially were repeating the professor’s key points and were unable to precisely state what more they wanted to know. Mosteller had his students write down their muddiest points on pieces of paper, which were typed into a summary format and distributed. 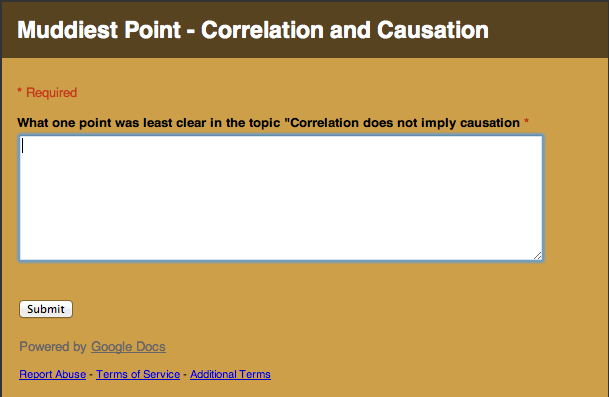 Online survey tools such as Google Forms bypass the use of paper, retyping the comments and printing handouts, thus faciliating the process of collecting, summarizing, and sharing student feedback. Once students have submitted their feedback, the Google spreadsheet results can be shared with them as a link.